The Epicurean Carnavale has been sitting in my humidor for some time now, begging me to take it for a spin. After a ton of yard work, a nice lunch, and a bit of rest I decided to head out back to enjoy the rain while enjoying this bad boy. The Epicurean Carnavale is one of the newest offerings from Epicurean to hit the market. 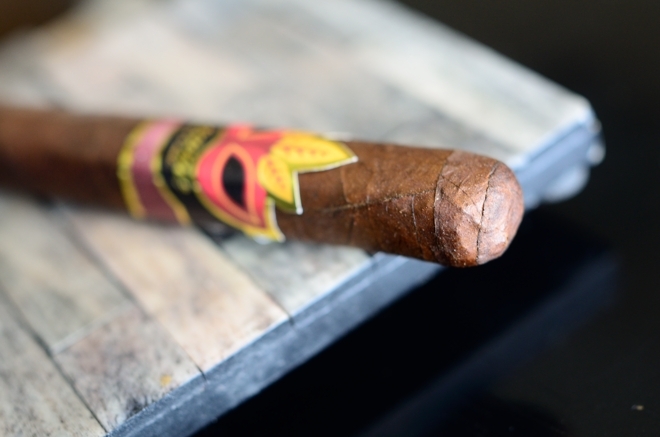 Created at the Plasencia Cigars S.A. factory in Esteli, Nicaragua the cigar features a Nicaraguan Habano Oscuro wrapper from the Jalapa region of Nicaragua, American Broadleaf and Honduran dual binder, with Nicaraguan Ligero fillers. The Epicurean Carnavale is offered in four sizes: Lancero (6.5 x 38), Petite Corona (5.5 x 48), Toro (6 x 52), and the Trabajdor (5 x 56) all coming in boxes of 20 with a total of 1,000 boxes of each released ranging from $8.60 to $10 a stick. The Epicurean Carnaval Petite Corona is a pretty small cigar, but the box pressed format makes it fit comfortably in your hand without it feeling too tiny. The cigar starts out with a very consistent, very dark brown wrapper. There is a bit of darker splotches around both the foot and the cap o the cigar. The wrapper features some very minor veins along with a lot of natural webbing in the tobacco leaf. 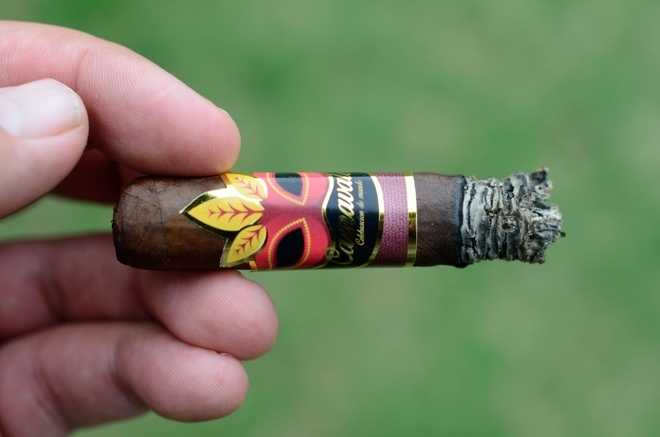 The cigar has a nice firm, oily texture to it with a decent amount of tooth. The long, slender, box-pressed body leads up with a stubby, round double cap. 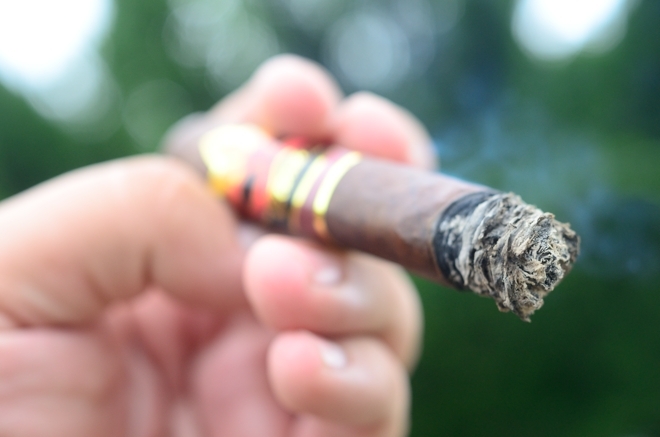 The Carnaval is very firm and only carries a few softer areas around the foot of the cigar. 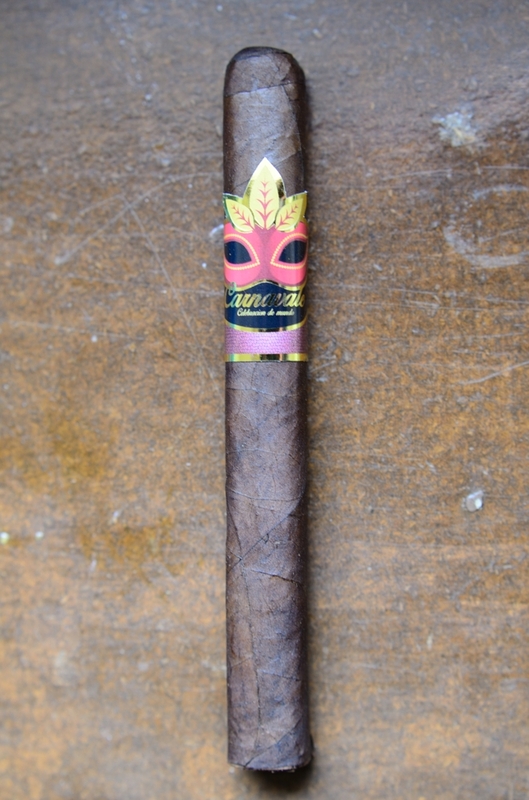 The cigar is polished off with a beautifully designed band featured a mask similar to those that you’d see at a Carnival event along with a gold “Carnavale” logo embossed into the front. 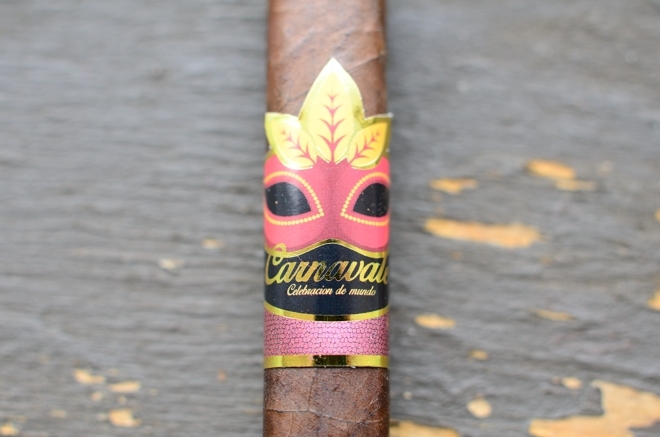 The wrapper on the Epicurean Carnavale gives off nothing more than a slight cocoa aroma while the foot of the cigar has some soft spice, pepper, and a bit of natural grassiness. The cap cut very clean and very easily using my Palio double bladed cutter. 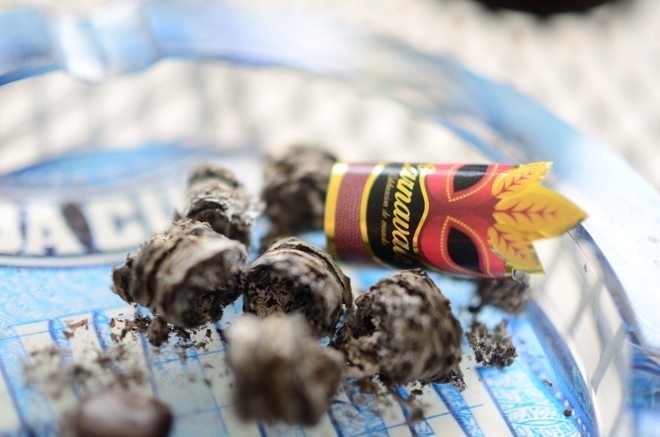 The cold draw produces a really mild mixture of cocoa and tobacco and not a whole lot else. The Epicurean Carnavale lit up with easy using my S.T. Dupont Maxijet torch. 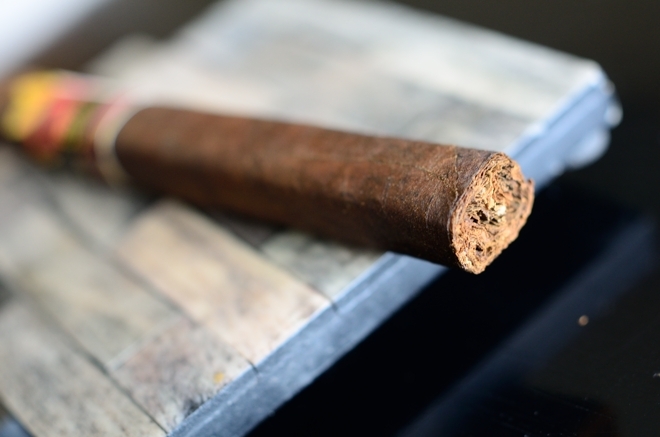 The cigar starts off with a very mild black pepper blast followed by some strong brown sugar, grassiness, cocoa, and honey with some slight woodiness and bitterness on the finish. I love how comfortable this small, box-pressed cigar fits in my mouth as it produces a perfect, massive cloud of thick smoke with every little puff. The burn line has a few smaller waves but is running razor thin. The ash is pretty flaky and only held on for about an inch before falling into my ashtray. The cocoa has really taken over the flavor profile in the Epicurean Carnavale. Backing the cocoa is some light woody flavors, a bit of spice, some sweet brown sugar, and light pepper. It almost seems as the flavors have become more muted in the second third as I was expecting the opposite. The retrohale is great as it coats my nasal passage with some potent cedar and spice. The burn line has completely corrected itself and is now burning dead even and razor thin. I am feeling nothing in the nicotine department as I close out the second third. Into the final third of the Epicurean Carnavale and much is the same. Lots of cocoa and wood flavors mixed with spice and sweetness. While those flavors are great, it would be nice to see a bit more change ups throughout the experience. It took me about an hour and a half to take this cigar down to the nub and I experience no harshness what so ever. 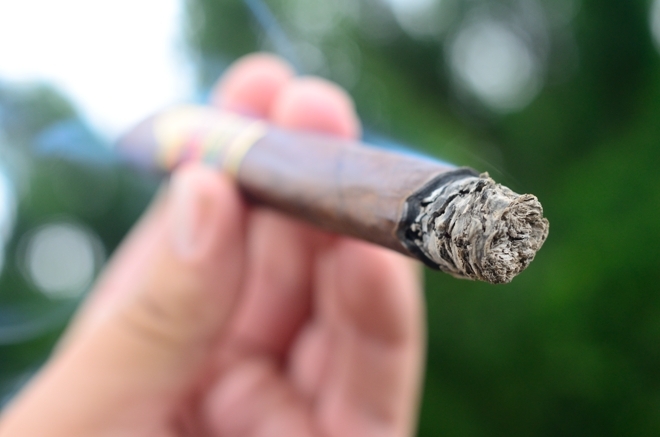 The cigar always burned on it’s own and I never once had to reach for my lighter to touch up, or relight the cigar. I close out the final third feeling only a slight nicotine kick. The Epicurean Carnavale is a good cigar. It produces some great flavors, and a great experience. It’s not as complex as I was hoping for, and that’s probably my only gripe about it, but that falls on the subjective side as the cigar preformed flawlessly. I love the format, and the quality of the construction was perfect. I think this cigar is perfect for someone who likes solid smokes, and doesn’t normally reach for the more complex cigars. One note is going in, and knowing the blend, I was surprised with how modest the strength was. I was expecting a much stronger experience but was pleased with how balanced they were able to create the body/strength ratio in this cigar. Would I buy it again? Absolutely. While it won’t be in my regular rotation I would love to have this cigar around for those relaxing nights when I want a solid smoke to relax and enjoy some time in my backyard. I took a bit of a risk on the pairing and boy did it ever pay off. Going into the smoke I knew that there was just something missing, something that a beer could easily replace making this an incredible experience. To me, that “thing” was citrus. That being said I decided to go as citrusy as it gets pairing the Epicurean Carnavale with a bottle of Prairie Artisan Ales’ Funky Gold Amarillo. 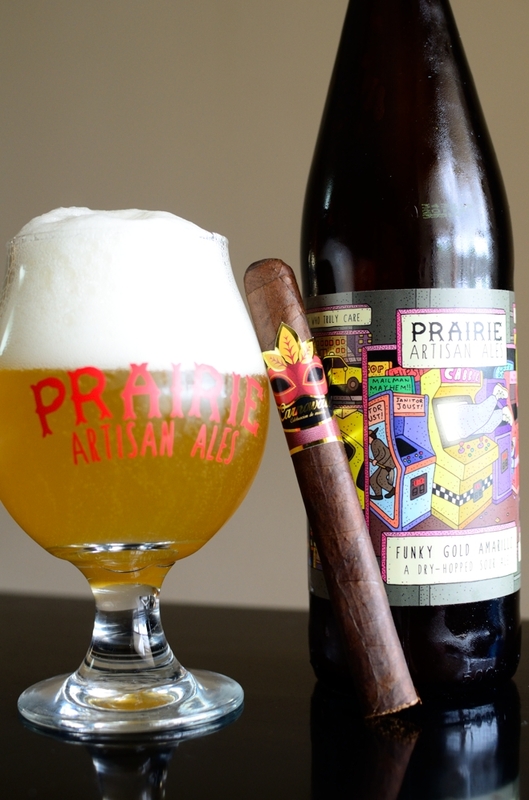 The Funky Gold Amarillo is a dry-hopped sour ale brewed at the Prairie Artisan Brewery in Oklahoma. Coming in at 7.5% this sour ale leads with a nice, nippy sour punch backed by strong orange and lemon notes, with a smooth, light mouthfeel before finishing very crisp with a nice hop, citrus and spice. This is by far one of the best sour ales I have ever had the pleasure of drinking and it really helped feel that gap in the cigar’s flavor profile. I need to take some lessons from you on pairing. Or maybe I need more money to be able to try everything out, lol. I enjoyed the Carnavale I had, but I preferred the Gonzo. The Gonzo Rocked! haha It’s all trial and error 🙂 and I have had me some errors. I probably never would have thought of that pairing. You really have it down! haha I don’t mess around! Thanks for stopping by!